Trump told religious leaders they should be able to endorse politicians. 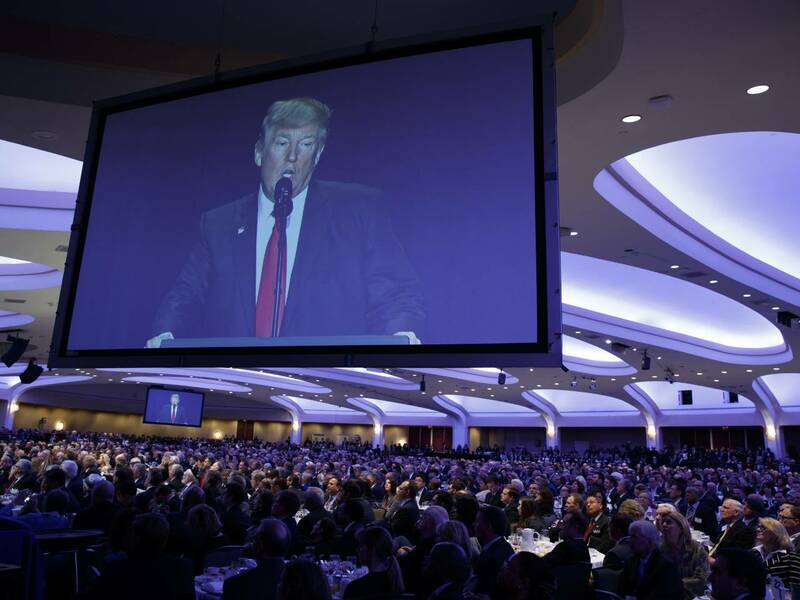 President Trump spoke at the National Prayer Breakfast this morning, an annual gathering of religious leaders held in Washington D.C. He told the crowd that his administration will “totally destroy” the Johnson Amendment – an IRS rule which says that non-profit organizations (including churches) must refrain from endorsing specific candidates running for office, or risk losing their tax-exempt status. The Johnson Amendment is named after former president Lyndon B. Johnson, who proposed the rule change back in 1954. The policy was widely supported, and passed with little resistance from lawmakers on either side of the aisle. Although the rule applies to all non-profit organizations, churches tend to be the most affected. Pastors have to be careful when talking about politics on the pulpit. Any message to vote for or against a particular political candidate can be considered grounds for removal of tax-free status. That said, over the years a number of clergy members have protested the rule by delivering overtly political sermons. The IRS will often threaten to act on the infractions, but rarely delivers any real punishment. Some are concerned about mixing politics into religious services. Above: the pastor of a megachurch addresses his congregation. The incoming administration was expected to be friendly to religious groups, but the announcement still came as a surprise. Many people are worried that if the rule change goes through, politics and religion will become further intertwined. 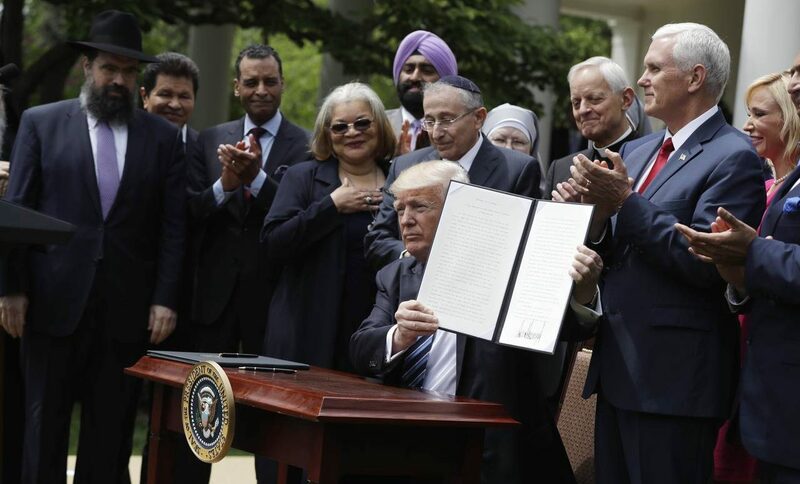 President Trump hinted at this new reality when he said that the Johnson Amendment violates the American “right to worship according to our own beliefs.” But are religious beliefs synonymous with political beliefs? One can envision Sunday services during a future election season turning into quasi-campaign rallies for specific candidates. While free speech is often cited as the crux of this issue, another aspect involves political donations. If the rule changes, churches would be free to give money directly to politicians. 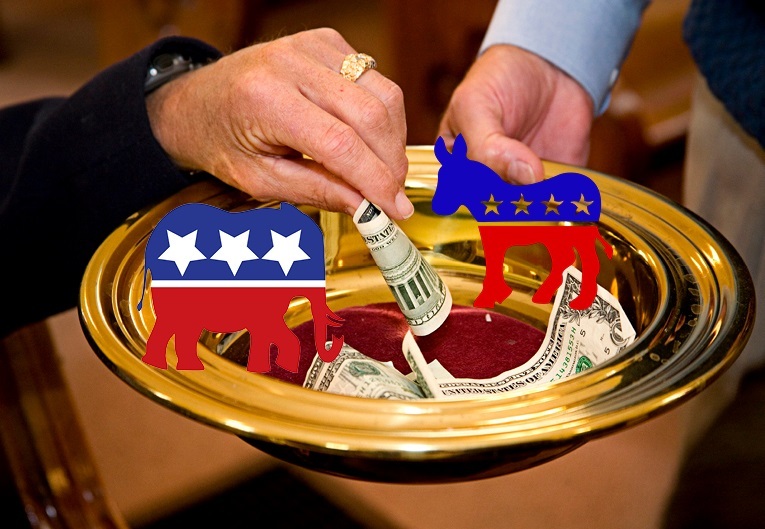 Since any contributions from parishioners would be tax-free, churches could become large fundraising groups for political candidates – essentially transforming them into religious Super PACs. In 2015, a Christian polling firm called Lifeway found that 79 percent of Americans believed clergy should not endorse candidates while at the pulpit. Even among evangelicals, support for was quite low; only 1 in 4 thought it was a good idea. However, certain outspoken evangelical pastors, such as Jerry Falwell Jr., have expressed strong support. “Politicizing churches does them no favors. The promised repeal is an attack on the integrity of both our charitable organizations and campaign finance system. Inviting churches to intervene in campaigns with tax-deductible offerings would fundamentally change our houses of worship. It would usher our partisan divisions into the pews and harm the church’s ability to provide refuge,” the organization said. The issue is clearly complicated. On the one hand, church leaders want to able to touch on politics in their sermons – and even endorse specific candidates if the situation calls for it. On the other hand, opponents argue that repealing the Johnson Amendment will have unintended consequences. What do you think about the president’s plan? Should churches be permitted to get involved in politics? Once upon a time, churches could and did act effectively for social and political change. But now we have Twitter, Facebook, flash mobs, blogs, and websites for every possible cause or movement, etc. There are numerous ways for people to get and feel involved in the issues of the day. Furthermore, churches are already dwindling. I fear that churches will get into politics at their peril. People today come to church, temple or mosque for support, inspiration and to experience the sacred. They can satisfy their political cravings without getting up on a day off for morning services. So, in addition to losing the tax break, politically active church risk losing bodies in pews. My ministry is in Unity, which has no history of political activism. So my opinion is not based on experience. I agree, I do not believe there is room in the pulpit for politics or politicians. People go to church to celebrate God. If a minister wishes to influence his congregation, he needs to do it with his actions, not words. Absolutely not unless they want to pay taxes just as the rest of us do! Amen sista. Not unless they pay taxes. No endorsing candidates for the church exemption. Of course churches should be able to endorse politicians. But not just any politician! Only GOOD, DECENT, GOD-FEARING men like Donald J. Trump deserve our votes! No church should be involved in politics they need to just stick with the word of God and pray for the ones with the leadership. To enact your law, you would have to legislate the definitions of good, decent, and God-fearing. Mr. Trump can be proven otherwise by his own actions, regardless of which dictionary you choose for your definitions, regarding goodness and decency. As for God-fearing, he may claim to be, but he is clearly unfamiliar with the Holy text he claims to subscribe to publicly. Therefore, even that is in question. That being said, would you support, say, a Wiccan President? A Pagan President? How about a Buddhist one? How about a Scientologist? Do you want Xenu’s followers deciding your fate? All of these people can be good, decent, and God fearing. If that is your only criteria, I suspect you would welcome a Jewish or Muslim President as well. If you cannot wholly support a President of any of these faiths, then your criteria of good, decent, and God fearing are insufficient to declare your true intent. As for the political aspect, how would you reconcile the separation of church and state with the elevated status of a church being directly linked to a political candidate? They clearly would not be separate if they are endorsing or campaigning for one candidate over another. Would you support the rights of each pastor, reverend, minister, rabbit, imam or other religious leader to campaign as they wish independently, or do you think the church should be able to fire them for not supporting the candidate the head of the church desires? If you support only the head of the church’s choice, then you are violating the rights of every practitioner of faith under that church. Before you choose too swiftly to relinquish your rights in favor of a short term goal, consider the ease with which a cult rises to gain followers. Jonestown is notable for a reason. With today’s social media and other avenues for outreach, that incident could have been much larger in scale. With our laws as they are, Jim Jones could easily have founded a church in the US. Be careful what you wish for. The repercussions can be staggering, and statistically, they will rarely be in your favor in the long run. I have to admit, I was raised never to bring up two (2) topics of conversation in any group, religion and politics. These are like oil and water and should never be mixed. I would NEVER want my Temple to support ANY political event/person/candidate/side. I personally am a Libertarian, however, I will not now nor ever ask my people to favor anyone over another, Your religion and your politics are your own business. It is my feeling that politics should not be in the church. Even a minister who talks politics in a church or lets politicians use the pupit for campaigning is not right and should not be allowed. There is a separation between church and state and that’s the way it should remain. I think people go to church to find peace in their hectic lives. Politics is stressful, not peaceful. Leave it out! Real simple. No discussion needed. NO. Simple. No is the only answer. If a member of the church disagrees with the political leanings of the minister they have a right to stand up and leave. That would cause rifts within the church. If anyone wants to talk politics, let them take it outside! NO WAY, WHAT WOULD JESUS SAY, NO WAY !!! The constitutional principals of our nation should be the final arbiter in these matters. We cannot allow religious leaders to have undue influence over political matters, nor can we allow political leaders to have undue influence over religious ones. The line separating church and state is a thin one at best. Allowing the endorsement of specific political leaders would be crossing that line. If I am adult enough to choose a religion and decide which church to attend, I am also adult enough to choose a candidate and vote for them without being told who to pick. The church should stick to cleansing soiled linens and saving souls, not imposing their religious teachings on the country through the voting booth. Additionally, if I am not adult enough to choose a church, or to choose a candidate, then I should sign up for citizenship courses immediately! I agree. And in that case a tax exemption would be inappropriate. “My House shall be called a House of Prayer, and you have made it a den of theives”. “Do not be as the Priests, who place much burden on the people with their laws”. “Do to others as you wish others to do to you”. No one is taking away any persons freedom of speech, the issue is using a covering of religion to sway peoples political opinions. He is not prevented from saying it under freedom of speech. Personally he can say whatever he wants and the government cannot stop him. When he speaks as a pastor, he is not speaking personally, he is speaking professionally. 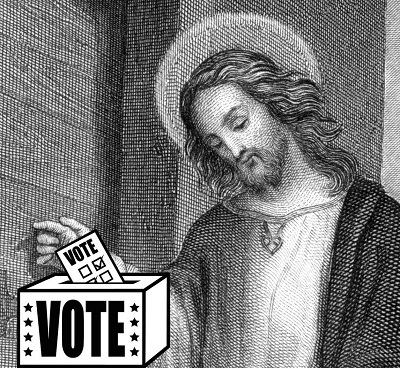 He is prevented from using his power to coerce others to vote his way, such as preaching from the pulpit that you must vote for Jack and if you vote for Jill you are not a good Christian, not going to heaven, going to hell, excommunicated from the church, not allowed to vote at all, etc. Your vote is your own, and should not be influenced by whether you feel your soul is in peril because you disagree with your pastor. God gave you free will. Use it as best suits your views, not those of any one else – and that includes your pastor. “My House shall be called a House of Prayer, and you have made it a den of thieves”. “Do not be as the Priests, who place much burden on the people with their laws”. “Do to others as you wish others to do to you”. No one is taking away any persons freedom of speech, the issue is using a covering of religion to sway peoples political opinions. No No No I don’t believe in any part of it. Who represents those that have no deity or fable. Which religion do you promote. We already have a problem with separation of church and state. Separation of Church and State is paramount to the founding of America, where I am from. Knowing our history and what we fled, I cannot in good conscience destroy one of the founding tenets of our nation. To mingle the two would be a step towards theocracy, not democracy. We struggle as it is to retain our democratic roots and ensure them. If churches want to give up their tax exempt status than they are free to preach politics from their pulpit. If they want to keep their tax exempt status than they need to peach the lesson of God and keep their mouths shut when it comes to politics. 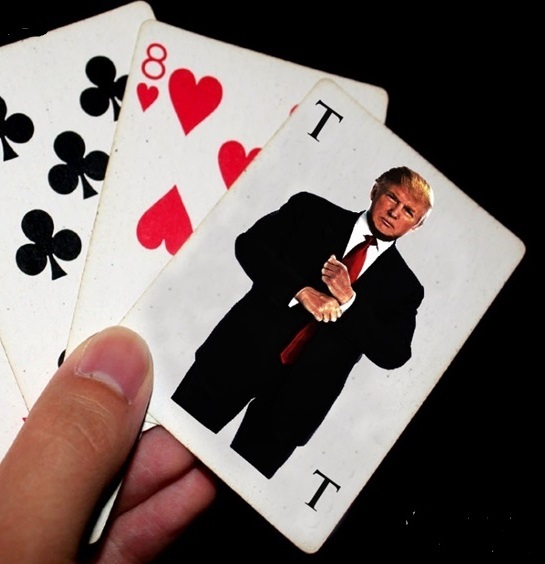 Trump is the best thing to EVER happen to this country and in two weeks has already solidified himself as our greatest president ever truly annointed by God. Overturning Obama’s Jesus hating laws is the best thing he can do. Jesus and Trump will lead this country back to a holy greatness! Trump professes to be a Christian. No person with such a complete disregard for the 10 commandments will lead any Christian to Holy greatness. His deeds aside, his actions to keep foreigners from our shores and to defund programs that aid the least fortunate is in direct conflict with Christianity. The list of examples he provides in this direction grows daily with his reign. When he reverses himself and truly behaves like a Christian, perhaps he could do some good. Forgive the reference to Jim Jones, but, brother, you’ve been drinking too much Kool-aid. The Jesus so many folks know would be appalled at this man. Think, please think! Church and State must remain separate, not for Tax purposes but for ethical reasons. 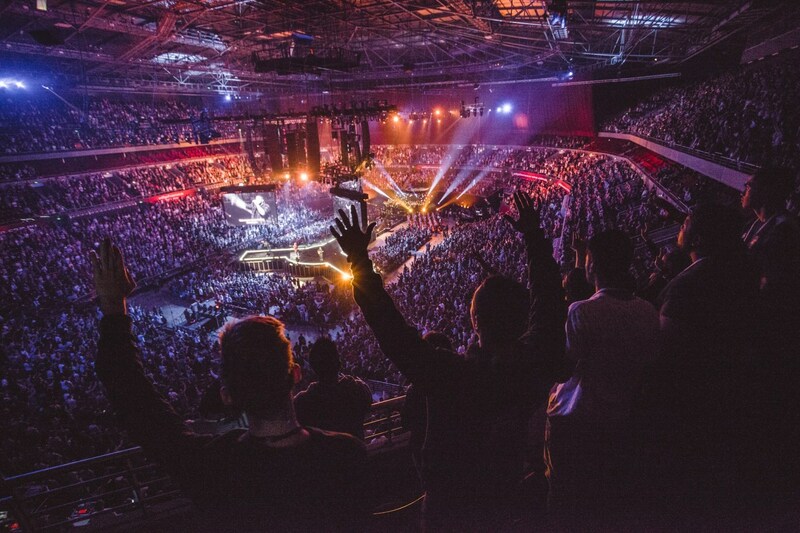 The Church is no place for Politics, only Gods Grace is timeless, Politicians come and go. If you are a good Christian person you should have, (especially in our nearing the final days), one thing on your mind. You should be living your life for one purposes and one purpose only which is, striving your hardest to fully belong to the family of God the Creator of this Universe. This should be paramount on every Christian’s mind. Politics has absolutely no business being any where around a church service. Ever since I entered the age of accountability, (around six or seven years old), I have been trying to find a politician that does not lie. I try my hardest to live my life the way God has told me too and a person who lies as much as a politician does I just do not want to be around these people. In this day and age it becomes very hard to shield one’s self from the evil that has infiltrated itself throughout this world which is now being run by satan along with the myriad of demons he has at his beckoned call. Politics, or I should say, (using a word the Holy Bible uses), lawlessness. Therefore, I urge you to find the humble fealty to God and Christ Jesus Our Lord. He died on the cross, and if even the President, or even Queen Rania (whom I deeply admire) need help in seeking out their salvation, then I offer my hope and prayers for that hour! If this is as my God desires of me, Blessed be the Lord, and Thank you for all you do for me Jesus my God!!! I love you Father…Amen Thank you for this day and please bless our Nation, giving all of our leaders (at the Congress and Courts to the Executive branches, even down to the lowest level of local government), wisdom and Holy Guidance so that they may do what is right for all of us and to repair these chasms which seem to evolve from the hearts-Heal our hearts, because Father God we know that what goes into us is just as important as what comes out from our hearts and lips! Bless the teachers and Industrial leadership because just as the Pope say they too shape the future of our world and our youth! Lord thank you for your blessings for all of the technology and the medical advances you have helped us… Lord please help those that can manage it to give what ever is needed for the sick and those suffering. God please ease the pain of those that might not be hurting because of physical, but please comfort and bring peace and help to some who are in mental anguish Father-You know each and every situation! Dear Lord Please keep all of those that give so much of themselves to protect others, and often extend their lives into the path of harm!! In the Name of the Father, Son, and Holy Spirit, Amen! Church and state, the founding fathers wanted to keep them separate from each other for a good reason. They had just defeated a theocratic monarchy to gain our nations independence. They knew all to well what happens when you let religion and politics mix. The middle East is a good example of why this is a good idea. But so are a few European countries. I think repealing the Johnson act is about the worst thing any President of the United States could do. Frankly, it almost seems like he’s trying to butter up the religious leaders to support him should he run for a second term. If you’re the head of a tax exempt institution, a church, a temple, a mosque, whatever it may be, when you enter that sacred space, you should leave your politics at the door. There are a few Catholic bishops that need to learn this lesson. They do threaten their congregations with hellfire and excommunication for not voting a certain way. This has gotten sorry, so short version, bad idea. Leave things alone. Endorsing an honest, moral, worthy candidate in a corrupt, dishonest, immoral political system might provide the opportunity to spread a message during the election campaign, but not to have the candidate actually elected. At least not beyond the local level. But why toss your representatives into a system that will eat them alive? backlash (like audits and tax status reviews). I’ve used my ULC ordination to secure a spot in the “Pastor’s Point” section of a few newspapers. There are around a dozen or so contributors, representing mostly Christian churches, who also take turns with submissions. Here’s column that was published a few years ago that elicited a number of positive comments, some also published. Perhaps it will inspire some of you to use your ordinations to have your message read in venues in addition to this one. Many of those who regularly post here compose and present their thoughts very well. Being ordained opens doors that might otherwise be closed. I suppose churches can endorse politicians and in fact, many have been doing so for a long time. It is wrong, however for churches to suggest that their endorsement is God’s endorsement and to tell congregations that not towing & voting the church line is a sin.